Winter Park, Florida — Daniel Frank Sedwick, LLC held their 6th overall and 2nd fully live internet auction of numismatic and shipwreck treasures on October 15-16, 2009, realizing a record price of over $1.6 million* in 2082 lots. Featured in the sale were coins and artifacts and printed materials from around the world, including the prestigious collections of Mark Bir, Louis Hudson, Herman Blanton and Thomas Sebring. "This was by far our best auction, and the feedback from both consignors and bidders has been overwhelmingly positive. We greatly exceeded our goal of $1 million, and over 94% of the lots sold," said Daniel Sedwick, company principal and founder. "We were honored to present for sale several great collections of coins and artifacts, including a few significant coins that are rarely offered at auction. This is proof that our relatively new and rapidly growing Treasure Auctions are a competitive specialized option for consignors, with an unparalleled level of personalized service from beginning to end for both bidders and consignors alike." Setting the tone for the sale was lot 1, a Mexican cob 8 escudos fully dated 1709, which found a home with a private collector for a record price of $46,000*. Some 70+ gold cobs followed thereafter. A couple of exceptional Panama cobs also set records: Lot 1176, the finest known 4 reales, sold for an impressive $22,425*, and lot 1178, a choice half real, sold for $19,550*, both to significant private collections. Aggressive prices were also encountered in the Louis Hudson Collection of Potosi Countermarked Coins, over 70 lots of the rarest examples of a short-lived and controversial period in the colonial coinage of Potosi (1649-51). Also heavily contested were many dated shield-type minors of the early 1600s. A large selection of silver cobs from the Atocha (1622), including several from the famous Research Collection, saw spirited bidding as well. 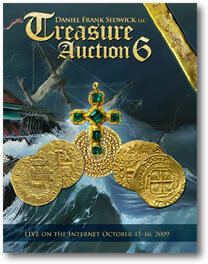 Prices realized for all lots sold in Treasure Auction #6 are available online at www.sedwickcoins.com. Treasure Auction #7 in April of 2010 will present another impressive selection of cobs and important numismatic and shipwreck trophies. Consignments for this upcoming auction will be accepted until January 31, 2010.